Combine the Classic and Boutique style hair bow with a personalization to create a look that's all your own. Bow Dangles TM hair bow line can be personalized with your child's name, initials or monogram with two or three letters. Available on a barrette or headband, in all colors and four different sizes, add a personal touch to an already picture perfect hair bow. Put your girl's name on a hair bow today! Boutique and classic style hair bows with monogrammed buttons. 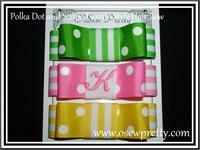 Classic style hair bows with your childs initial or first name embroidered on your color choice of ribbon. 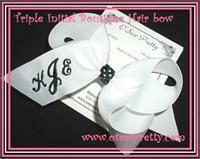 Tuxedo style hair bows made from your choice of Solid, polka dot, stripe,or printed ribbon with optional child initial. Personalized Loops with tails hair bow. 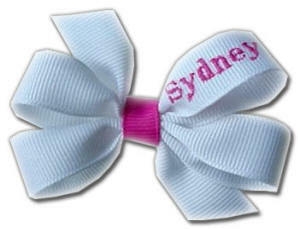 Boutique Style hair bows with your childs name or initial monogrammed on the hair bow. 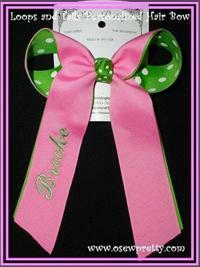 Classic hair bows personalized with childs name on the tails of the bow.